Thank you to everyone who joined us on 26th June, for the webinar “Protein Aggregation – Bridging the SubMicron Gap.” We held this webinar because we know that the formation of protein aggregates is a particular concern for parenteral administration biopharmaceuticals due to increased immunogenicity, and that as a consequence, companies increasingly need to monitor levels of subvisible particles present in therapeutic protein products initially and over the course of the shelf life. For subvisible particles between 0.1 – 10 µm this has, up until recently, been challenging. 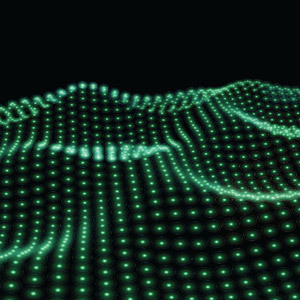 The webinar focused on the how the Archimedes instrument, which uses the technique of resonant mass measurement, provides a unique solution to this challenge. 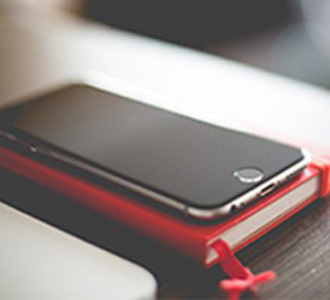 We received many questions during and after the webinar, so we have taken this opportunity to answer them all here. We hope the information below is useful, but as always, if you have any further queries about the Archimedes system and its capabilities just drop us a line here at Malvern and we’d be pleased to help. Q: Is calibration needed prior to each measurement (day-to-day)? And how long does it take? Calibration is a quick process, taking around 10 minutes and requiring a 1µm latex standard and a sample of Deuterium. It should certainly be performed every time the sensor is changed, but does not need to be performed prior to each measurement. The question of how frequently calibration should be performed, is not straight forward, and will depending to some degree on your own procedures and requirements. However, as a recommendation, calibration should be performed if the Archimedes has not been used for a while. If the equipment is in regular use, it would prudent to perform a verification run using a latex standard each morning, prior to running samples, to ensure the sensor is clean and in good working order. Not necessarily. A Gaussian distribution would assume a uniform distribution of particle sizes, but protein aggregation is a complex, dynamic process. Therefore, the degradation pathways leading to the formation of aggregates will determine the size ranges that are produced. The other point to keep in mind is that the bin sizes used to report the particle size counts will also influence the distribution. Finally, as the Archimedes counts particles one at a time, the total number of particles counted will also influence the distribution seen. Therefore, important consideration should be given the number of particle counts required for analysis, and how this data should be used. The raw resonance data is not impact by particle shape, as the Archimedes is actually measuring buoyant mass. However, when we make the transformation from dry mass to size, we are assuming a spherical shape (see figure below). At present no, the Archimedes can’t be linked to a SEC system. However, linking the Archimedes to an HPLC system would be detrimental to the data obtained, as the SEC column and filters would filter out the large particles, and so remove them from the Archimedes particle distribution. 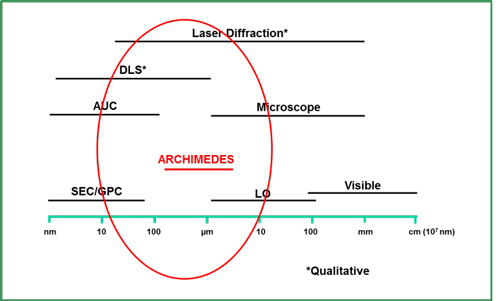 The Archimedes measures a particle size range that is different to the size range that can be measured using HPLC, and so these two technologies are not really compatible. When talking about proteins, concentrations of several hundred mg/mL have been successfully measured using Archimedes. A pure high concentration sample would not be expected to produce much fluctuation in the baseline, and so will pass through the sensor smoothly. The only limitation with regards to high protein concentration solutions would be viscosity, as the Micro sensor has a limit of 100cP. In addition, very high concentration of aggregates can be challenging to measure, as the RMM system relies on detecting particles one at a time. There is no lower concentration limit. The Archimedes is detecting particles only. If the protein concentration is very low, you would expect that the number of protein aggregates formed would be very low. Therefore, the samples would need to be run for a longer time on the Archimedes to ensure particles are detected, if they are present. Q: What are size ranges for the two sensors? The Archimedes measures buoyant mass, and so the size range will depend on the density of the material. For latex beads, the size range is: Nano: 200nm – 1,000nm; Micro: 400nm – 5,000nm. However, protein aggregates have a higher density, and so the size range is: Nano: 100nm – 1000nm; Micro: 200nm – 5,000nm. Of course, for different materials, the exact size range will be different, and so should be determined experimentally. The Micro sensor would be the preferred choice. This gives the wider particle size range (see question above) and is still able to detect particles down to 250nm. In addition, the protein size range of the Micro sensor, 200nm – 5,000nm cannot be measured using any other quantitative methods at present (see image below). As with many other liquid analysis systems, very large particles and aggregates risk blocking the fluid path. If visible particles are present, indicating some protein precipitation, it would be advisable to filter the solution before analysis. The Archimedes is easy to set up and easy to run. The main challenges are really focused on ensuring the sensor is kept clean and in good condition. It would be advisable to wash the sensor between protein samples, and ensure it is thoroughly cleaned at the end of the day before being left for any extended time. However, anyone familiar with using other techniques, such as HPLC, will be used to such cleaning regimes to ensure chromatography columns are kept in good condition, etc. Q: ­What are the standard procedures for cleaning the senor? Each and every particle is counted and measured to obtain a size. The particle is then reported in the distribution graph, in the appropriate size bin. As more particles are measured, they are each added to plot in the correct size bins, leading to an increase in the particle counts. This then produces a distribution plot of all the particles counted, each reported in the appropriate sizing bins (see graph below). The size of the bins can be altered to increase or decrease the number of different particle sizes reported. At present, no. The regulatory agencies require companies to monitor and quantify protein aggregates at size ranges ≥ 10µm and ≥25µm, as described in USP-788. However, there is a growing interest in the 0.1 – 10µm size range, as described in the FDA’s guidance to industry (“Guidance for Industry: Immunogenicity Assessment for Therapeutic Protein Products”; 2013). There is clearly a move towards characterising and quantifying protein aggregates at the smaller size range. We are currently waiting on more details from the regulatory agencies and the USP as to how the Biopharmaceutical industry should address this. Yes. During installation, an IQ procedure will be run on the Archimedes, using NIST-traceable latex bead standards. Data will be compared to pre-determined acceptance ranges. Not really. If the sensor is blocked, then no fluid will be passing through the resonator, and no data will be obtained. 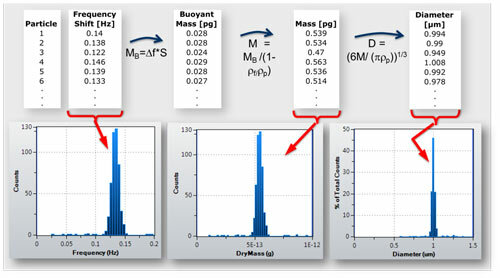 This would be easily observed from the data profile, especially if there is a sudden drop in particle counts. The Archimedes has what is called a “sneeze function”, which will force solution through the sensor to produce a clear frequency change (see image below). If no change can be seen, or it is very weak, there is a chance the sensor is blocked. We would recommend using volume to measure the particles. This will give you a clearly defined experimental protocol, allowing you to compare different samples. The problem with running samples by particle counts is if your sample is very pure, the Archimedes will be running for a very long time, until it reaches the count limit. 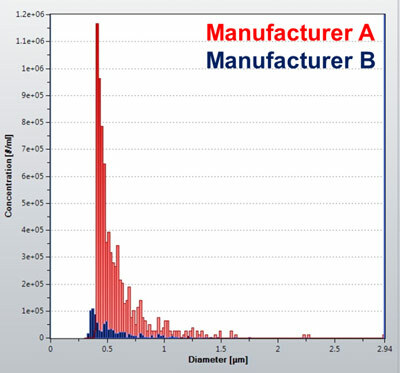 Of course, if you have samples with different particle concentrations, and run by particle counts, the volume analysed from each sample will be different, making comparisons more complicated. In this situation, running by volume or time would be preferable. Q: ­Is the Archimedes sensitive to vibrations on the bench? Protein aggregation – which method of detection do you prefer?